I know that I owe you a letter, but have been holding off just to see if the package you had sent would arrive. Said package arrive this morning and the contents were in good condition. Thanks a lot for it. 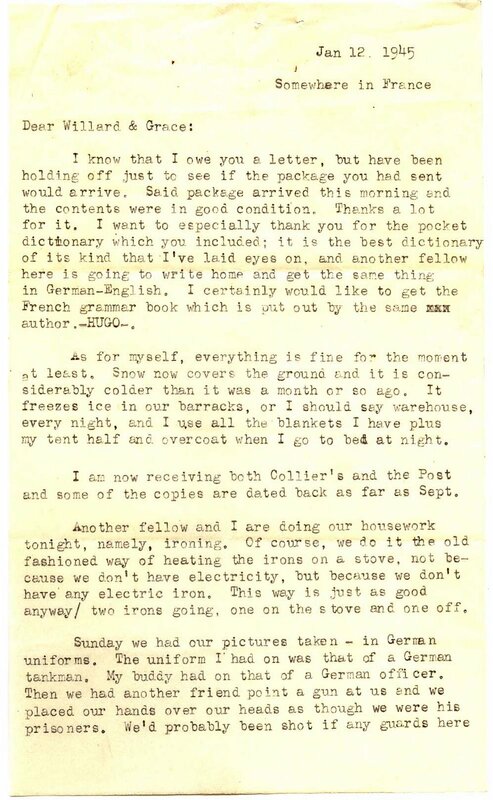 I want to especially thank you for the pocket dictionary which you included; it is the best dictionary of its kind that I’ve laid eyes on, and another fellow here is going to write home and get the same thing in German-English. I certainly would like to get the French grammar book which is put out by the same author – HUGO -. As for myself, everything is fine for the moment at least. Snow now covers the ground and it is considerably colder than it was a month or so ago. It freezes ice in our barracks, or I should say warehouse, every night, and I use all the blankets I have plus my tent half and overcoat when I go to bed at night. I am now receiving both Collier’s and the Post and some of the copies are dated back as far as Sept.
Another fellow and I are doing our housework tonight, namely ironing. Of course we do it the old fashioned way of heating the irons on a stove, not because we don’t have electricity but because we don’t have any electric iron. This way is just as good anyway / two irons going, one on the stove and one off. Sunday we had our pictures taken — in German uniforms. The uniform I had on was that of a German tankman. My buddy had on that of a German officer. Then we had another friend point a gun at us and we placed our hands over our heads as though we were his prisoners. We’d probably been shot if any guards here had seen us as they are a trigger happy lot. You know, I’ll be the stores at home are not as cold as they are here in France. I was in one the other day, and of course, the clerk came up and waited on me just like in a department store at home. But most of the clerks dress just as you would when going outdoors here. It was almost as cold inside as out. But the French know how to decorate store windows. No matter how shabby the shop may look from the outside, it is usually quite orderly and neat on the inside. But prices of practically all articles are very high. I looked at silk scarfs in windows (I took them to be silk) and they were priced up around 800-900 francs- around sixteen dollars in our money. That’s too much for me. The French do dress well, however. 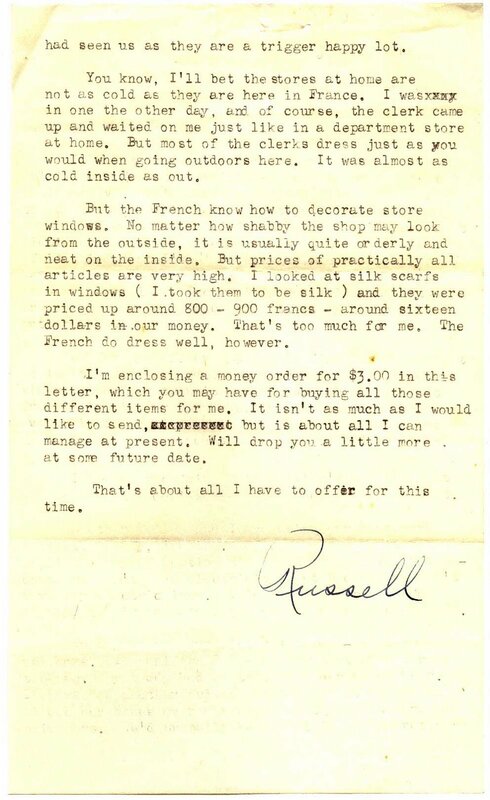 I’m enclosing a money order for $3.00 in this letter, which you may have for buying all those different items for me. It isn’t as much as I would like to send, but is about all I can manage at present. Will drop you a little more at some future date. That’s about all I have to offer for this time.